Amber Smith works to foster community and women’s leadership as the Women in Ranching Program Manager at Western Landowners Alliance. The WinR program at WLA has been in existence for less than a year. One gathering for Montana women in ranching have already occurred. 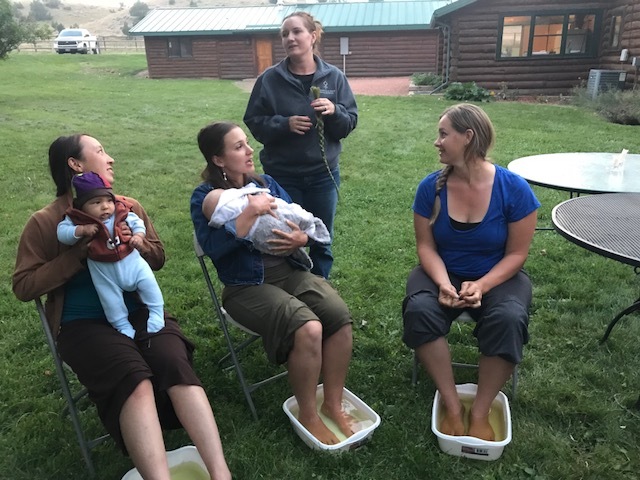 This summer, WLA is hosting two Montana “Circles” and one in New Mexico, with interested women reaching out from across the West. She and her husband steward a 53,000-acre ranch in Cohagen, Montana. Women gathered at Diamond Cross Ranch in Montana for Western Landowners Alliance’s first Women in Ranching event. Smith grew up riding and loving horses in Decatur, Illinois, but she didn’t realize ranches like the ones she’d seen in western movies still existed until she worked as a wrangler at The Home Ranch in Colorado. “My frame of reference growing up was being surrounded by corn and soybean fields. Farmers usually had 30 cows. I honestly believed that’s where beef came from,” she said. At The Home Ranch, she met Trevor, who had grown up on a ranch in Nebraska. They fell in love and after graduating from college in Chicago, she and Trevor started their lives together in rural America. Smith enjoyed her life working on ranches in rural communities but often found that the social element she craved wasn’t easy to find. She also found that at 22 years old, she was already being referred to as Trevor’s girlfriend, fiance, or wife. She said she wanted to play a larger role in her community, and wanted more for her life and her family. She said that while her family lives eighty miles from a town of any size, she strives to show her children that you can have a vibrant life full of diverse individuals with divergent viewpoints no matter where you live. Through her two children, she says she has been able to see what is integral to being human. She says in rural communities, people often confuse isolation with independence and think because they are isolated they are independent. In reality, she says she has often found more dependence in rural communities than she did in large, more diverse communities. She says there are wonderful traditions she would like to see continue in rural America, such as a strong work ethic, being frugal, valuing your family and community. She says that in rural communities, there can often be confusion between the values of traditional practices and traditional principles. Smith understands fear—and she also understands the importance of facing it. When she first joined the Council on Aging in Garfield County, Montana, she says she was the youngest person in the room by at least three decades, and she felt unsure. She’d spent six years working as an activities director at a nursing home in Nebraska and had a lot of interest in being part of the elderly community in her new home, but making connections initially was challenging. “Now that’s something I look forward to every month. It’s okay to be afraid, it’s okay to be uncomfortable for a long time. Have the grit, have the tenacity, stick with it and I promise it’s going to get better,” she says. She encourages women who are interested in pursuing leadership and building community to step out explore their interest, and do things that bring them joy, even if it is intimidating at first. In 2017, Smith received a message on Facebook. The message said there would be a gathering of women in ranching at TomKat Ranch in California that March. Was she interested in joining the group for four days? “Right away, my thoughts were that the weather is terrible in March and I can’t leave for four days. Then my reaction was I have anxiety driving around Billings, Montana, let alone San Francisco,” she said. She told the organizers about her fears and they reassured her that she could ride with someone else. The weather improved, and she decided she would go. The experience at the Women in Ranching gathering was phenomenal. Smith said she felt a strong sense of security and safety, she felt she was heard and valued for her voice in the circle, and that she was loved for attending just as she was. The group included women ages 20-64, with a range of roles on the ranch including landowners, land managers, and women who played critical support roles. The timing was perfect. Smith was stressed at home on the ranch, and she describes the sensation of taking time to talk to other women who were passionate about their land and livelihoods and making it work socially, ecologically and financially. Her husband says she didn’t stop talking for two weeks after the gathering. Smith decided she had to bring that same experience to women in eastern Montana. Great women jumped on board as facilitators and women and men were excited to offer funding. That all happened during August of 2018. Conversations began with Western Landowners Alliance about making Women in Ranching a permanent part of their organization. She was able to work with their communications director and financial officer, which added a huge element of professionalism to the event. Now, WinR at WLA facilitates monthly calls with a small group of women and more women continue to join. WinR focuses on a learning circle model similar to WFAN’s programming. In this model, the presenter is not at the front of the room. The focus is on fostering the community that is present in the space and giving every person a voice. Find more information about their upcoming gatherings on their website.